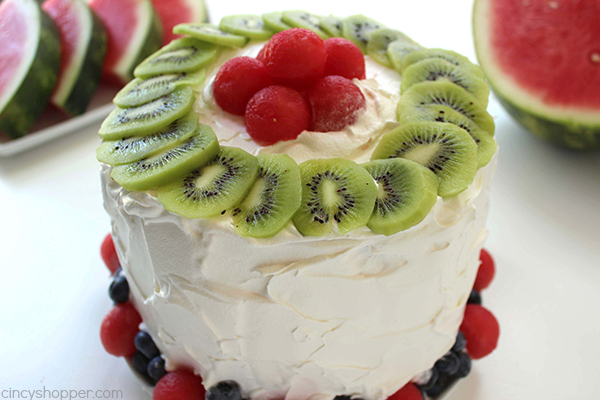 This super Easy Watermelon Cake will make for a perfect picnic dessert. 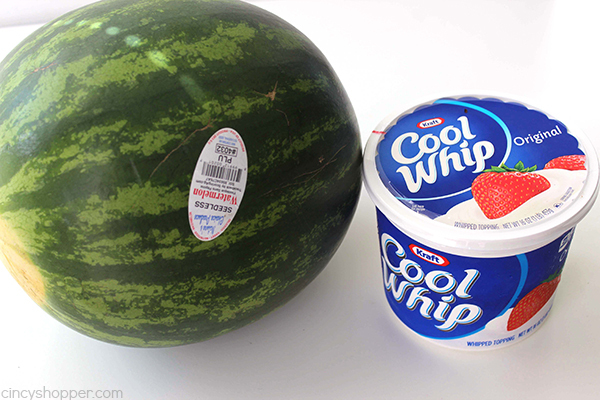 With just a watermelon and Cool-Whip, you can whip up this tasty summer treat in just a few minutes time. Watermelons have been on sale this past two weeks. I guess summer is finally arriving. YIPEE! My entire family LOVES watermelon. 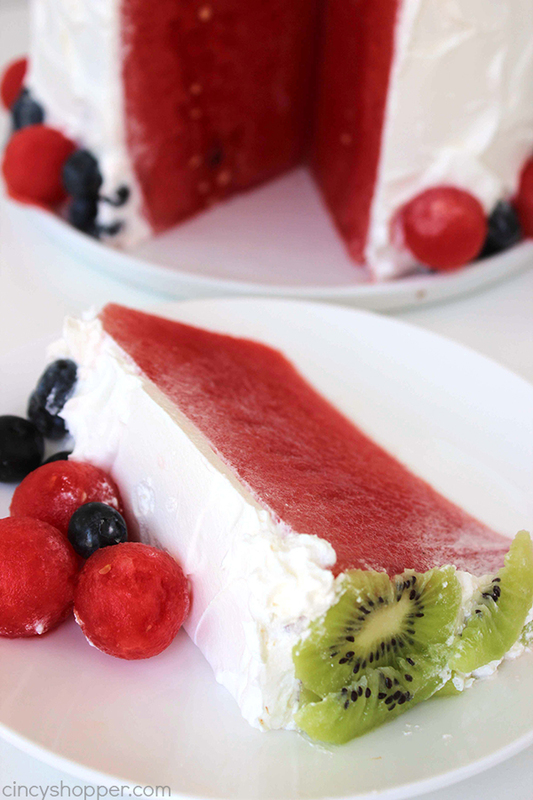 There are so many delicious watermelon desserts that can be made with fresh watermelon. 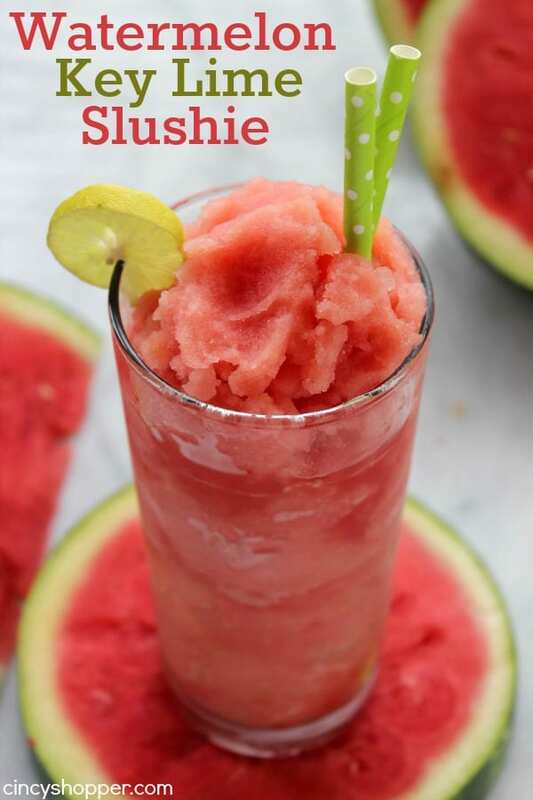 Watermelon is inexpensive, tasty and versatile in drinks, desserts and more. 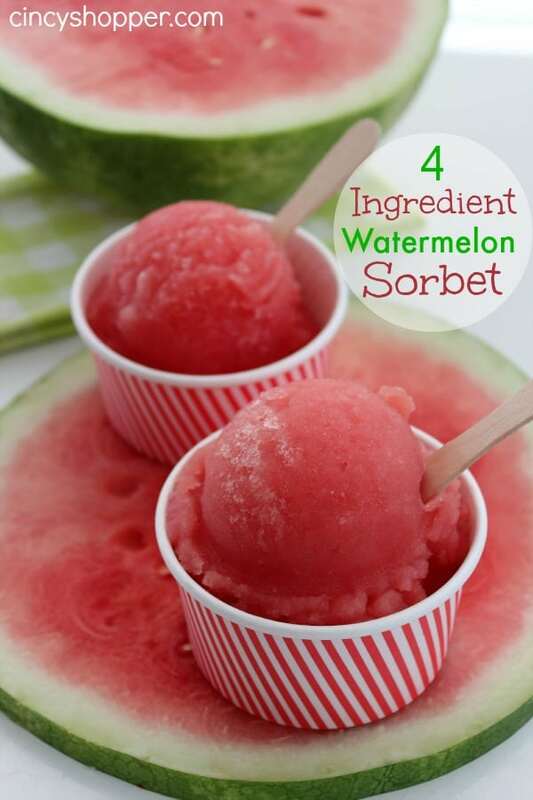 Our favorite summertime treat is our Watermelon Sorbet. 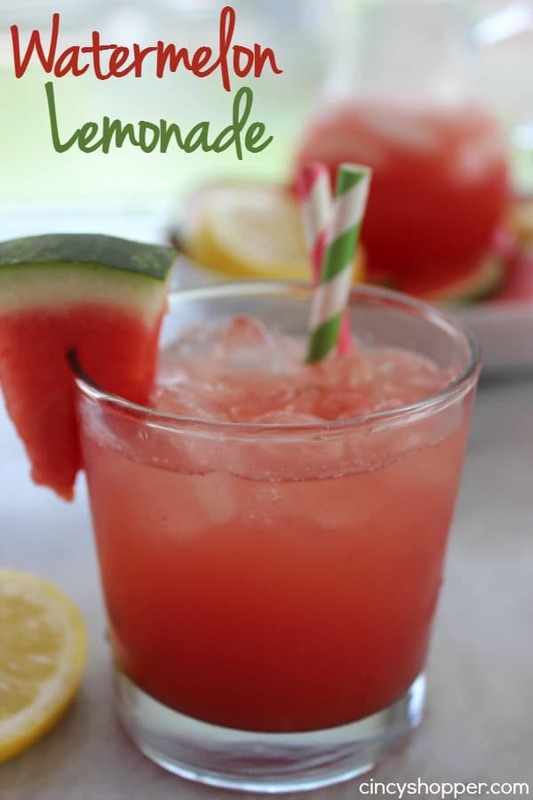 It is so easy, refreshing, and SUPER tasty. 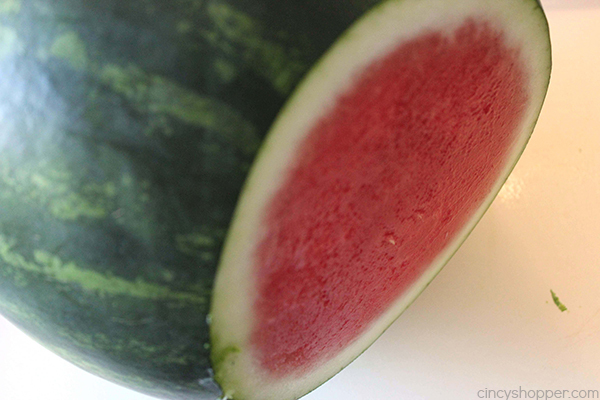 Watermelon is great all by it’s lonesome, great with salt, or perfect in combination with other summer favorites. I purchased two watermelons since they were on sale. I cubed some to enjoy as a side dish with our summer sandwiches. YUM! I also made some of our favorite Watermelon Salsa with some. Since we were having a grill out and I was in need of a quick and easy dessert, I whipped up this Simple Watermelon Cake. 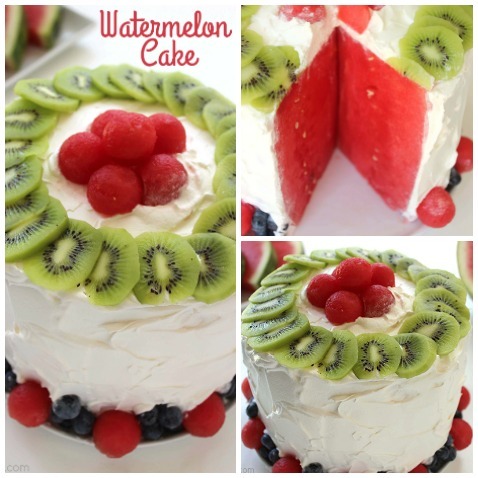 Last summer, I spotted the simple Watermelon Cake over on Kraft Recipes. It looked so easy. 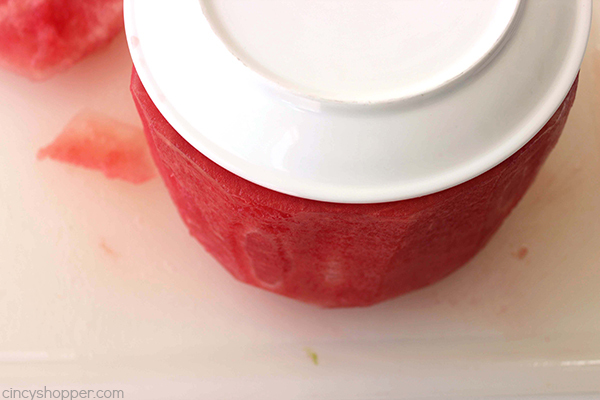 Just core out the watermelon, lather on some Cool-Whip, and toss in some additional fruit. So simple. I think our cake turned out well. I used a plate to have a circular guide and it only took just a couple minutes with some help from my hubby (he’s better with the sharp knives than I am, ha ha). 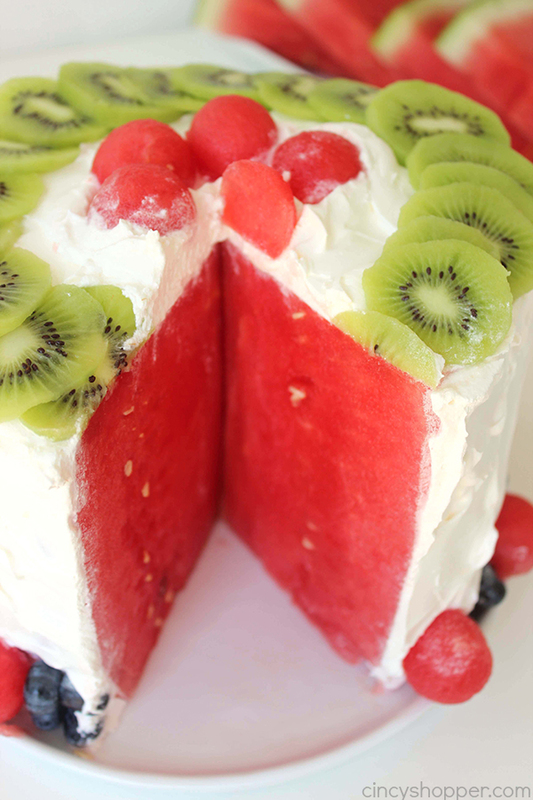 The only ingredients that are needed to make a Watermelon cake are a watermelon (I used seedless) and some Cool-Whip. I added in some watermelon balls, blueberries, and some fresh Kiwi just to give it some color. 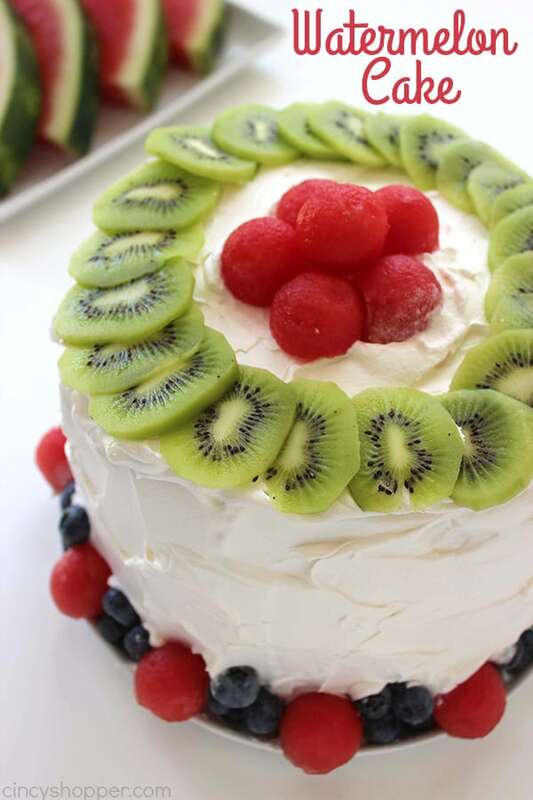 The addition of the fruit took our cake from plain to beautiful. 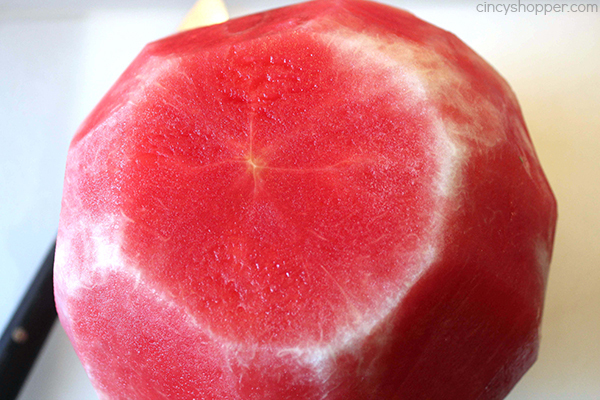 Cut ends off of melon to give flat top and bottom. 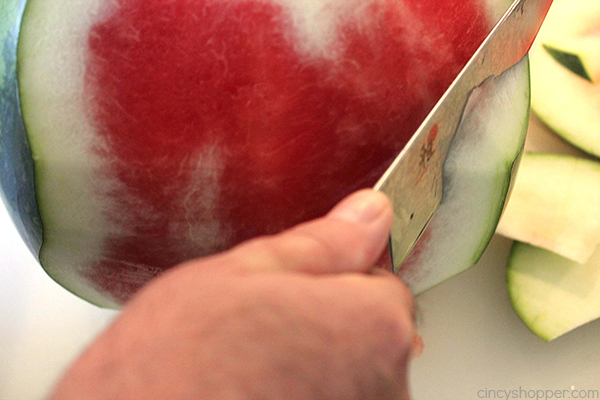 Take knife and cut off rind on sides. Place flat side down on serving dish/platter. You can put a round plate on top to use as a guide to even up sides. Wipe down top and sides with paper towels to remove excess moisture. 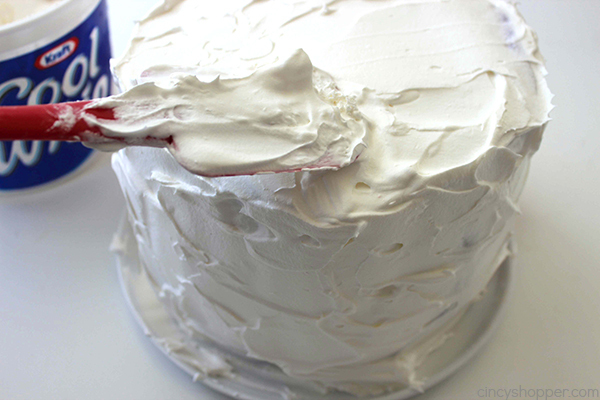 Use a spatula to spread whipped topping around sides and top. 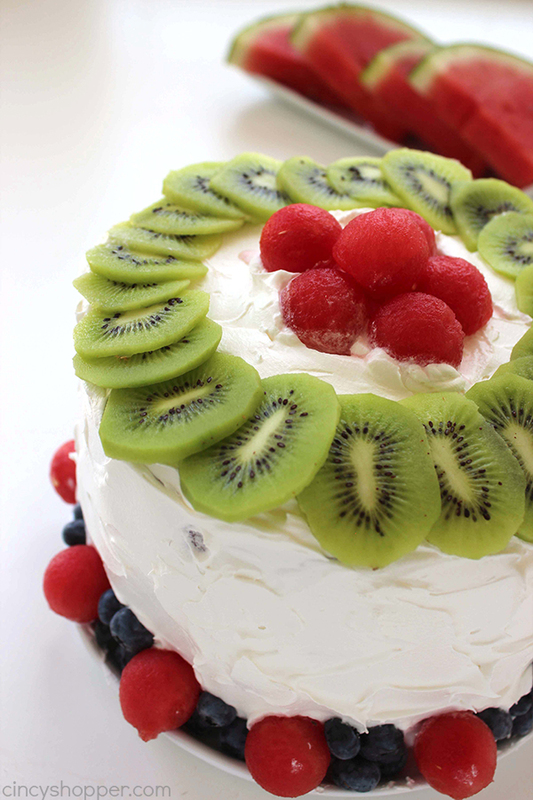 You can garnish with fresh berries, kiwi, melon balls, etc. 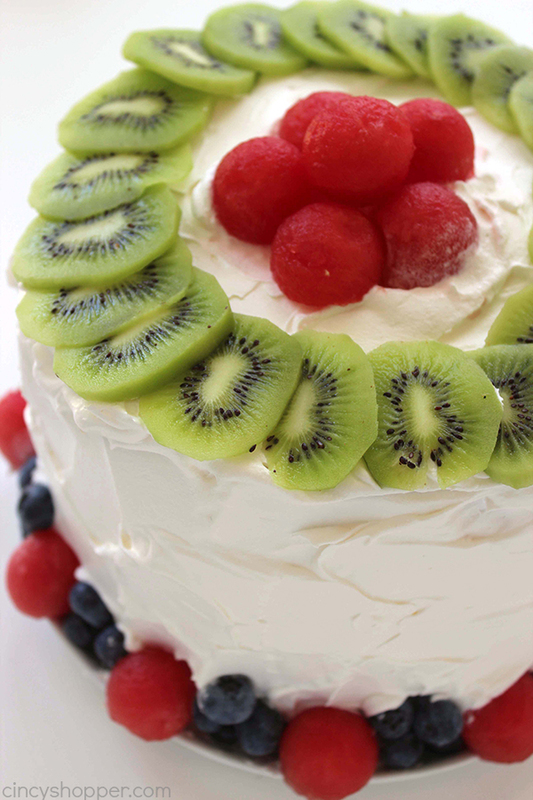 Since this dessert was so super simple, I plan to make one with strawberries and blueberries for July 4th. I may even add in some watermelon cutouts in the shape of some stars for the top. Simple but holidays, lol. Take knife and cut of rind on sides. 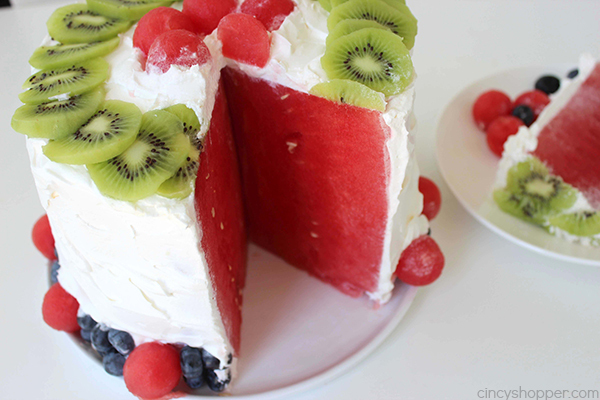 I love this easy stunning watermelon cake. It is perfect for the summer holidays, cookouts, parties, and more. Hi Jen, lovely cake, hope you’ll bring this on over to Food on Friday: Cakes over at my house (Carole’s Chatter)! This looks so yummy and refreshing! Thank you for sharing at Merry Monday!